If you live in the UK, you’ve almost certainly heard about the Alternative Voting referendum that is being held today. Essentially we vote for our politicians on a “first past the post” system whereby when a single candidate gets sufficient votes, we stop counting the rest of the votes and pronounce him or her the winner. This becomes a problem across many constituencies in England and Wales simply because some constituencies have enough people voting in a co-ordinated fashion to keep a single member of parliament or party in power year after year, even if the vast majority of constituents would have preferred something else. 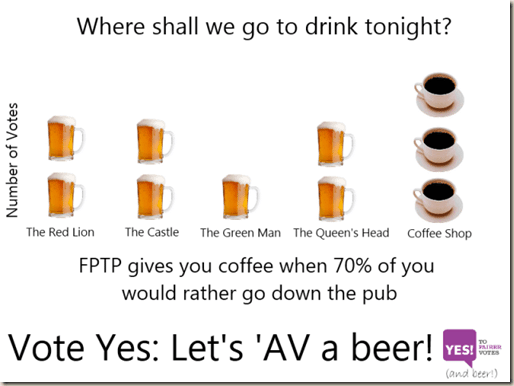 When a group of friends want to choose where to go for a drink (the most popular venue is the coffee shop, despite most of the friends wanting a beer from the alcohol-free coffee shop), it’s fairly obvious. 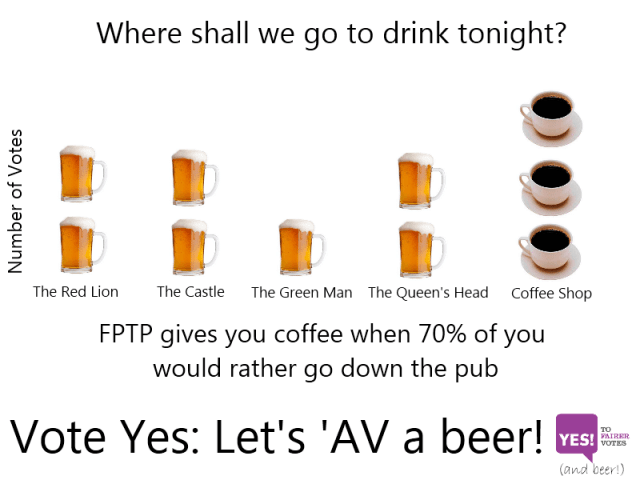 Those voting for beer at a particular establishment would be happy to compromise and have their beer (what they really want) at a different pub (not exactly what they want, but close enough) in order to avoid doing what they don’t want (coffee at a coffee shop). The obvious problem here (that no media outlet appears to be tacking) is that AV presumes that we are making a choice from a series of overall positive, top-flight, elite candidates. Clearly, we are not. If your employer was planning to purchase a fleet of cars and wants to know the preferred manufacturer, they may call for a vote amongst all eligible staff. The choices being BMW, Mercedes Benz, Audi. I’ll put a 1 by the Benz, a 2 by BMW and a 3 by the Audi – but ultimately it doesn’t particularly matter as they’ll all do the job well in their own ways. And the lack of decent candidates is the crux of the problem with alternative voting. My local councillor (mentioning no names in this blog post, but you may well know who he is) last knocked on our door last week. He comes out of the woodwork around the 26th April every year usually while we’re having our dinner. He promises a lot and doesn’t deliver a great deal, but this is ever such a common complaint and I can’t say that any of the other councillors (who don’t even go to the trouble of dropping a campaign leaflet through our door) are worth voting for either. 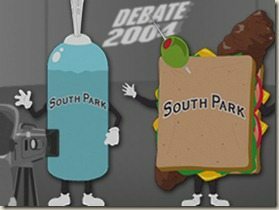 So who do I vote for on the slip of paper when I don’t recognise some of the names and certainly don’t know what they stand for? I used to know all of the councillors from my more active local issue campaigning days, but it’s been many years since our home was packed out to host a residents and councillors meeting. By voting yes to AV, we will get a system that means our local MP’s that are used to being regularly voted in by the same trusted demographic will lose the biased advantage (e.g. military towns typically block-vote Conservative in large numbers and hence the seat is almost impossible to change [so why bother working for the constituents?]). I expect that if AV is introduced that our local MP will have to do more work on behalf of constituents. We have an idea of the work they do published online as part of the public record. The “No to AV” campaigners say that we should maintain, “One person, one vote”, however the current system encourages causes strong safe seats and encourages lazy and unaccountable politicians. A “Yes” vote on May 5th would mean a loss for the long-established Conservative and Labour parties and a collective boost for the smaller and newer ones, including the Liberal Democrats. That’s what I think, what’s your opinion? Feel free to comment below! I don’t even understand why people think government should have the power to compel others on anything except crimes with victims… If government solely existed to protect property and individual rights, this wouldn’t even matter. Yes, you’re right. Governments grow. One thing we can always be sure of is that with each successive handover of power, governments get bigger, more complex and hungrier. “Nappies and politicians should be changed regularly, both for the same reason” – author unknown.